Congee (or Jook) is my favourite comfort food, my grandmother still makes it for me when I visit. A simple porridge made from rice and water, congee is easy to digest and absorb. 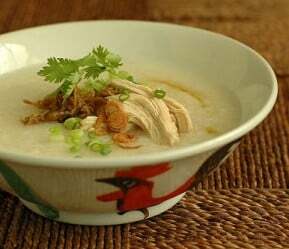 Congee can satisfy and warm the body in any season. In Traditional Chinese Medicine it is valued as both a nutritious food and a remedy for illness, and is mentioned in TCM literature as a cure for the common cold as early as 200AD. Congee is endlessly adaptable, but this version is a favourite. It’s particularly good if you’re convalescing from illness or just needing a bit of a pick-me-up. For a vegetarian version, omit the chicken and used water instead of stock. Add 5 thinly sliced dried shitake mushrooms (soak in cold water for around 1 hour first). Once cooked, add some cubed soft tofu and garnish with shallots, nuts, coriander and soy to taste. Combine the stock or water, rice, chicken and ginger in a large heavy based pan. Bring to the boil, then reduce to a simmer, stirring occasionally, until the rice has completely broken down, around 1 hour. To serve, remove the chicken, finely chop the meat and return to the pan. Place around 2 cups in a bowl and top with a few shallots and coriander, a handful of friend shallots of roasted salted peanuts, a drizzle of soy and a few drops of sesame oil.